My point is that I love Greek food, and tonight I’ll be serving a foraged version of tzadziki at my monthly girls’ night dinner. Traditional tzadziki is made from cucumbers, garlic, and yogurt, but this foraged version substitutes curly dock leaves for cucumbers. The tart flavor and crunchy texture of the dock leaves combined with creamy, thick yogurt make an excellent dip. Raw dock can be highly mucilaginous, especially when it’s young and tender. It’s a texture that some find off-putting, but combining the raw dock with yogurt masks the mucilage, and lets you enjoy the crunch of fresh, uncooked greens. 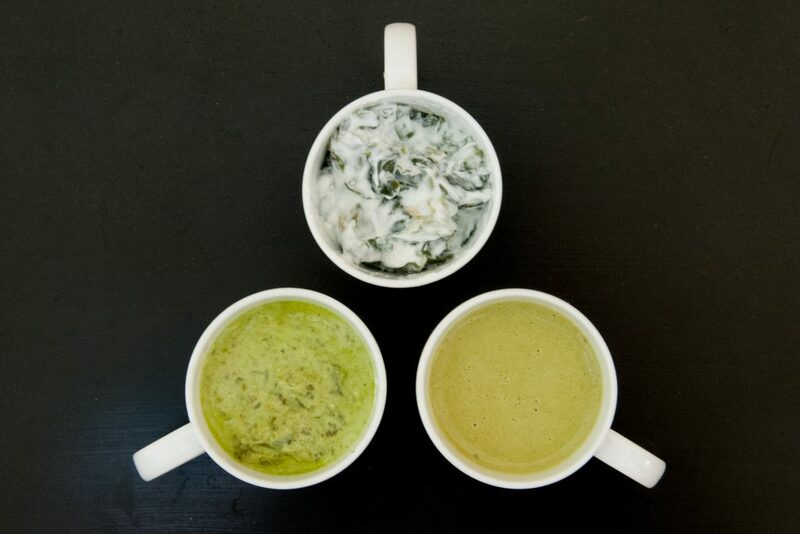 You’ll notice I’ve photographed three different versions of this dock and yogurt dip. The only difference is in how finely you process the dock leaves. Sometimes I give it a medium chop so I can appreciate the texture of the greens. Sometimes I pulverize the dock leaves to make a smooth green dipping sauce. The choice is up to you. Decide which version of this dip you’d like to make, so you can chop accordingly. My favorite is a medium chop with chunky pieces of dock leaves, so let’s start with that one. Wash and chop the dock leaves. Pieces should be approximately 1/2 – 3/4 inch long and 1/4 inch wide. You’ll want one cup, total. Set this aside. If you decide to go with the smooth version, roughly chop your dock leaves, then transfer them to the bowl of a food processor with one Tbs. of olive oil, and process to form a paste the consistency of pesto. In a separate bowl, combine the yogurt, minced garlic, and the (rest of the) olive oil. Add the dock, and stir to combine well. Add the salt and pepper, stir, then taste to adjust your seasoning. Dock and yogurt dip is a great accompaniment to grilled meats (like souvlaki), roasted vegetables, or felafel. Or, dip into a bowl of this foraged tzadziki with pieces of pita bread or raw veg like carrots, cucumbers, and sliced peppers. It’s a refreshing, healthy appetizer or condiment, and comes together in a flash.